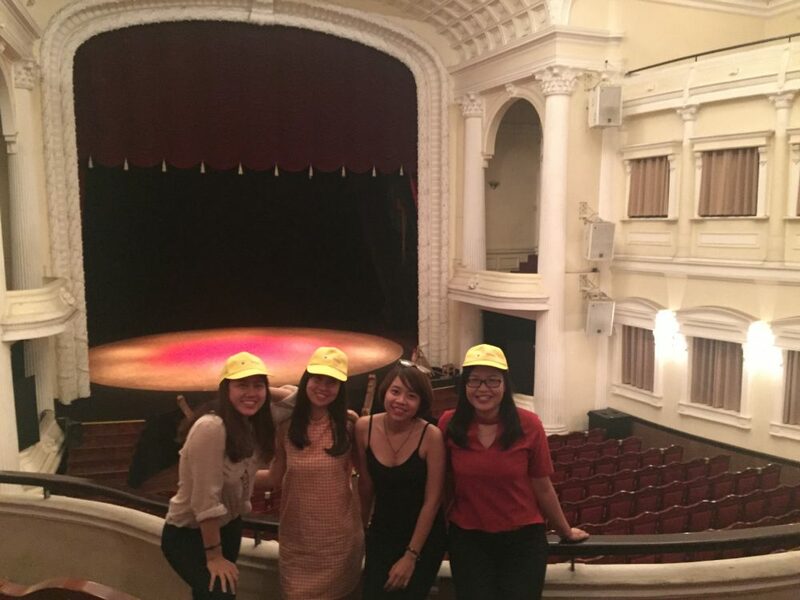 Last Friday, 4 members of our team had been invited to watch the Teh Dar show – an art performance depicts the lifestyle and culture of South West Vietnamese – an another version of the famous Ah Oh Show by Lune Production. 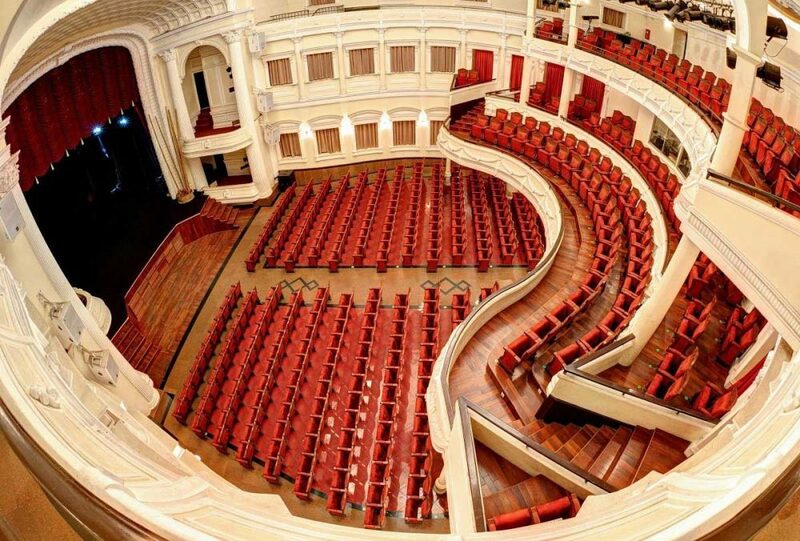 The performance is held in Saigon Opera House – one of the most famous landmarks of the city built by French Colonial. 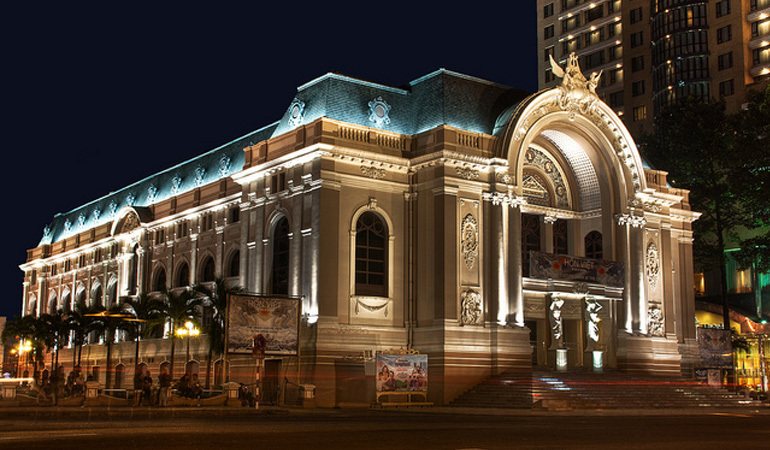 It is a smaller counterpart of the Hanoi Opera House, which was built between 1901 and 1911. 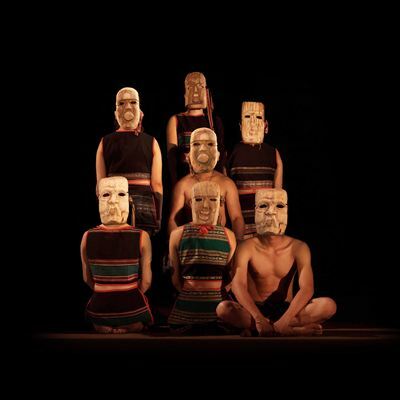 The name Teh Dar means “going in circle” as the South West Vietnamese believing in the life transmigration and how the cycle of birth, suffering, death and rebirth effect in each member of the society. 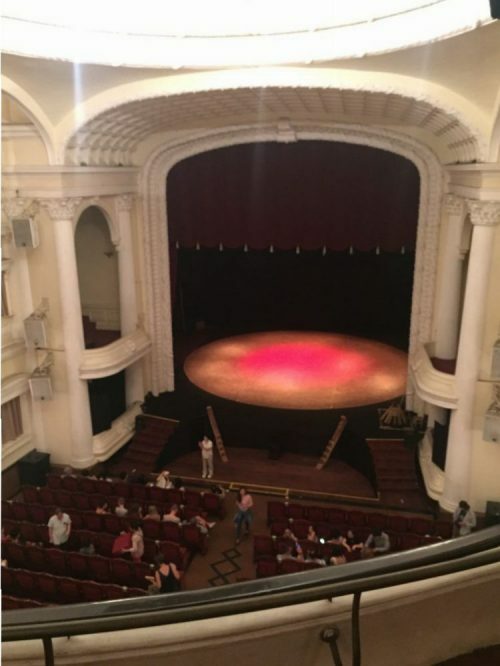 Before the show begun, the team had a chance to visit the theater to see how it would be sitting in a different location as the venue is separated into three sectors: “Ah”, “Oh” and “Wow” with “Wow” being the best location – seats to see the act. The girls posed for a picture in “Wow” section before any guests getting in. 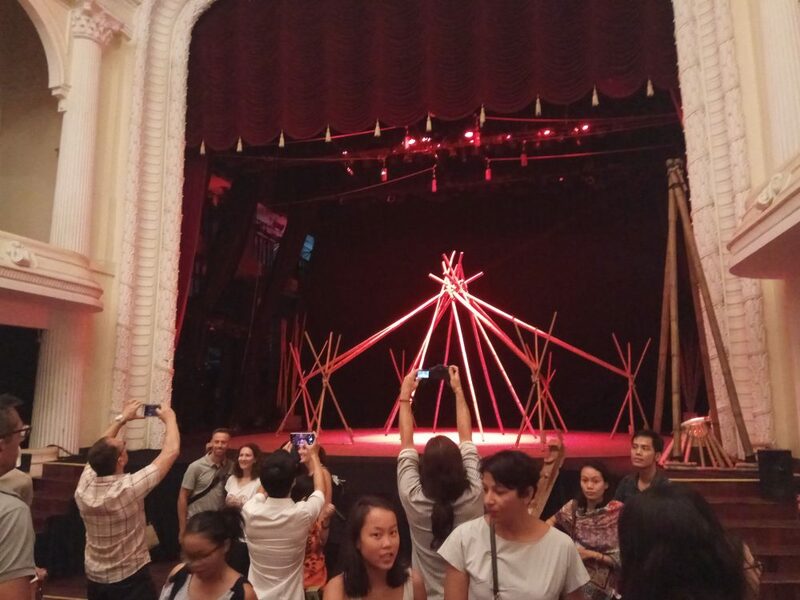 There was a refreshment area outside offer Vietnam teas and some sweet treat for the audience before the show. If you buy the ticket for “Wow” sectors, you can taste the wine from Dalat as well if you want. 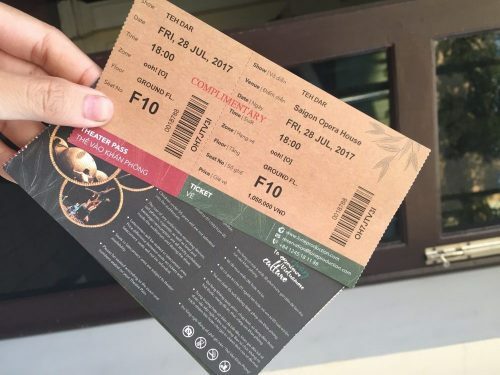 The front and back of the tickets. When the show started, no camera or phone allows keeping the show going smoothly as possible. The latecomers also would be asked to wait outside the first 10 minutes as the performance requires absolutely no outside lighting in that first 10 minutes of the show. During the performance, the team was going from one surprise to many others. 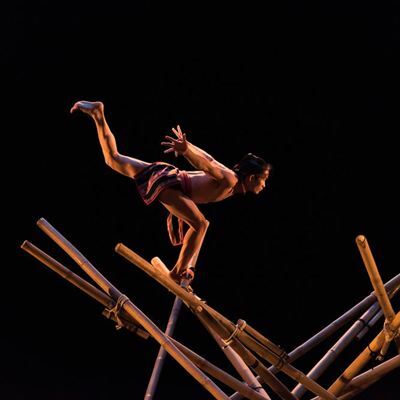 The cast illustrated the world of South West Vietnam with stunning bamboo cirque, daring acrobatics, and hypnotizing melody from exotic tribal instruments certified cultural heritage by UNESCO. 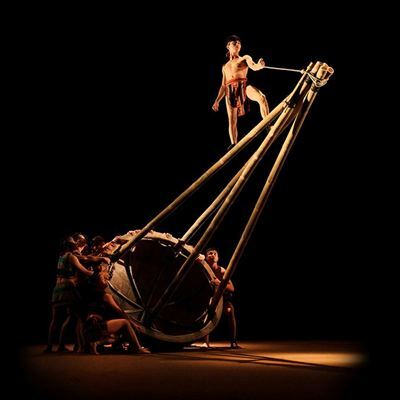 The haunting, beautiful, sensual performance by an absolutely gorgeous cast of men and women doing absurdly dangerous stunts. Like you can see from a picture below, he stood with one feet like that with being circulated around for almost 2 minutes from the height can be 3 metres to the stage’s ground. The performance was so great that after each act, the applause was so long and so loud. The girls’ hands got all red from clapping but wanted to express their love and admire so much. The whispers of “Wow”, “Amazing” and “Fantastic” were heard so frequently during the show. 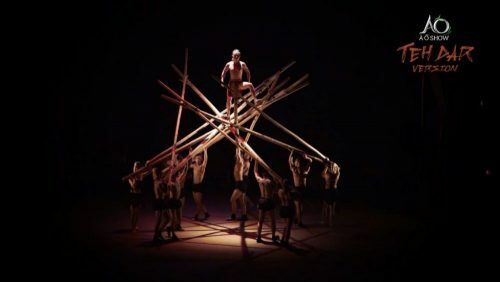 The combination of outstanding lightning, simple but authentic set design, live tribal instrument and singing with the jaw-dropping athleticism and musical skills of the performers made all of the audience speechless from the beginning till the end. After 60 minutes of madness, beauty and excitement, the show ended with standing ovation and the cast went outside by the main entrance followed by the excited audience. Despite of being so tired after the show, the cast and the musician gathered outside to take pictures with guests and allowed the audience to get close to them. The girls were thrilled and really speechless. One of them wanted to shake the hands of the artists so much but being shy ???? 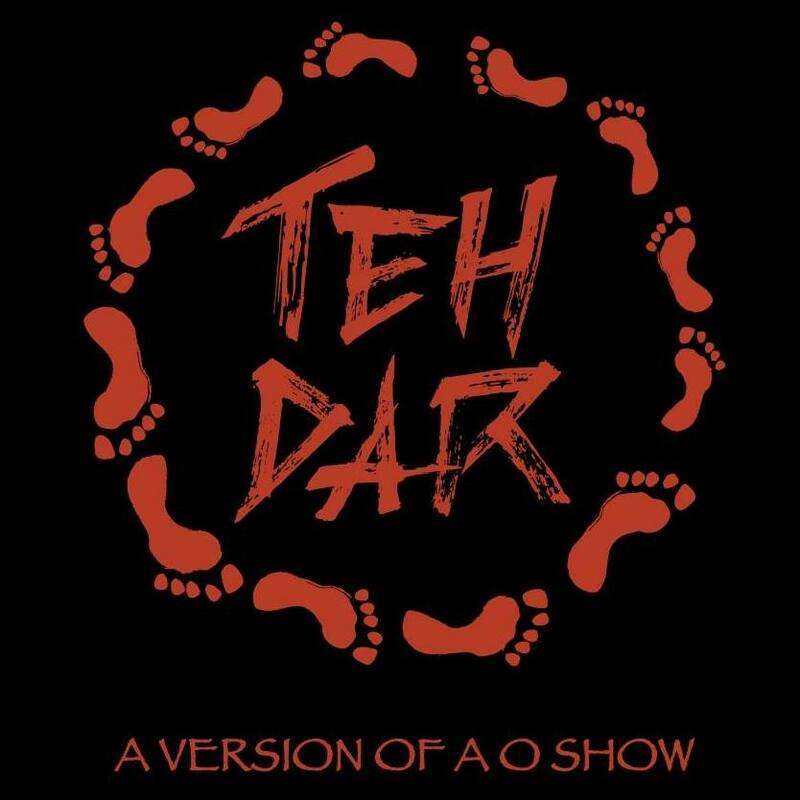 Coming back home after the show and all of them wanted to say just one thing “Teh Dar is so great that everyone must see at least once in their lives”. They love their experience and want you to experience it too when you arrive in Saigon with us.